The robust, long-winged Taita Falcon has a relatively short tail. Its wingbeats have been compared to those of a parrot in flight. 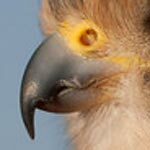 The Taita Falcon is a somewhat crepuscular bird, which means they are most active at dawn and dusk. 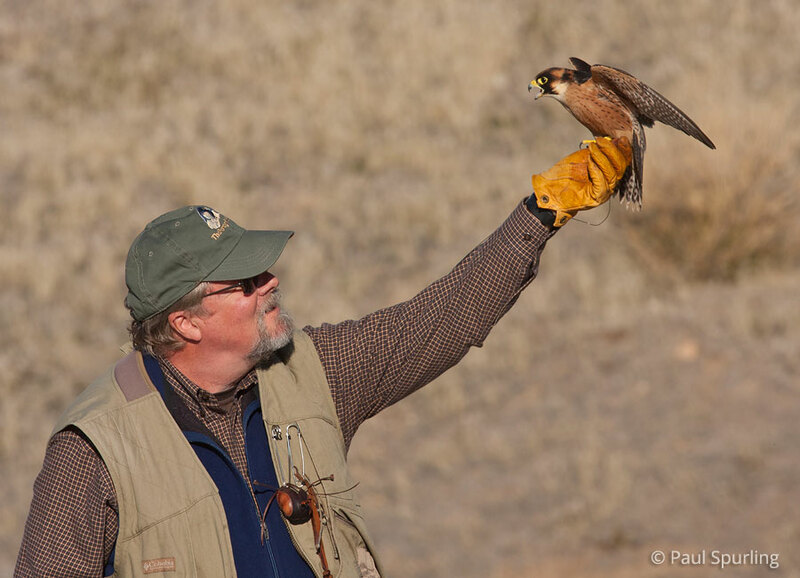 Since the 1980s The Peregrine Fund has supported students and biologists studying the Taita Falcon in Africa. Today, we continue to support researchers working with this rare bird. 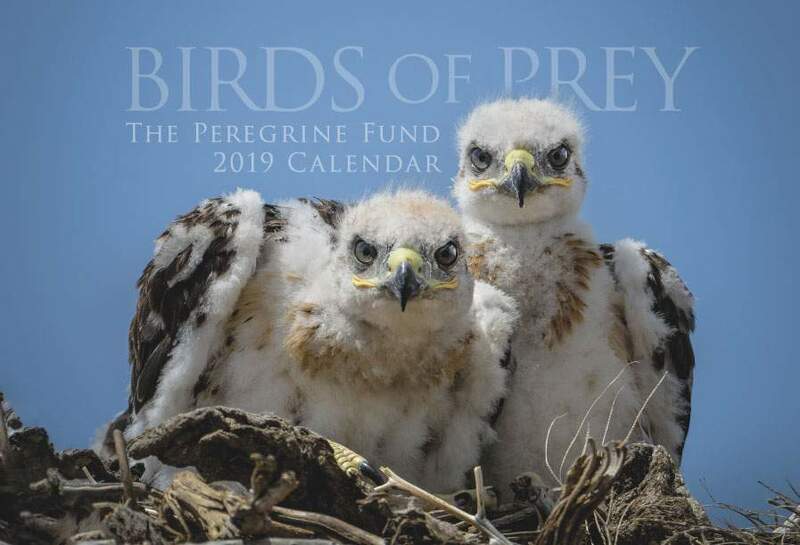 In addition, our efforts in scientific research, habitat conservation, education, and community development help conserve birds of prey around the world. We also supply literature to researchers from our avian research library, which helps scientists around the world gather and share important information on raptor conservation. The Taita Falcon, named for the Taita Hills of Kenya, is distributed throughout much of eastern Africa from Sudan and Ethiopia to Zambia, Zimbabwe, and northern South Africa. This swift falcon is usually found on or around large cliffs, gorges, or inselbergs, which are hills, mountains or ridges that jut up abruptly from otherwise flat terrain. Generally, this falcon prefers habitats that are relatively open, such as grasslands and savannas, and can be found in woodlands composed mainly of Miombo trees or Mopane trees, both in the legume family and unique to Africa. It may also occasionally be found in artificially open country, such as cultivated fields. The Taita Falcon has the distinction of living in the steep gorges near Victoria Falls (on the Zambezi River in Zimbabwe), the largest waterfall in the world. Talk about a view! There is no way around it: the Taita Falcon is a stunningly cute little raptor. 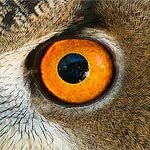 Adorned with a dark capped head and dark malar stripes (similar to the peregrine and prairie falcons), large eyes and a compact body, this falcon is guaranteed to provoke "oohs" and "aahs" from anyone lucky enough to get a close-up view. Add to that a buffy, lightly-spotted breast, slate grey back with intricate white lines that outline each feather, and bright yellow cere and feet, and we are talking about one adorable bird. The only time the Taita Falcon is more beautiful is when it is in flight. 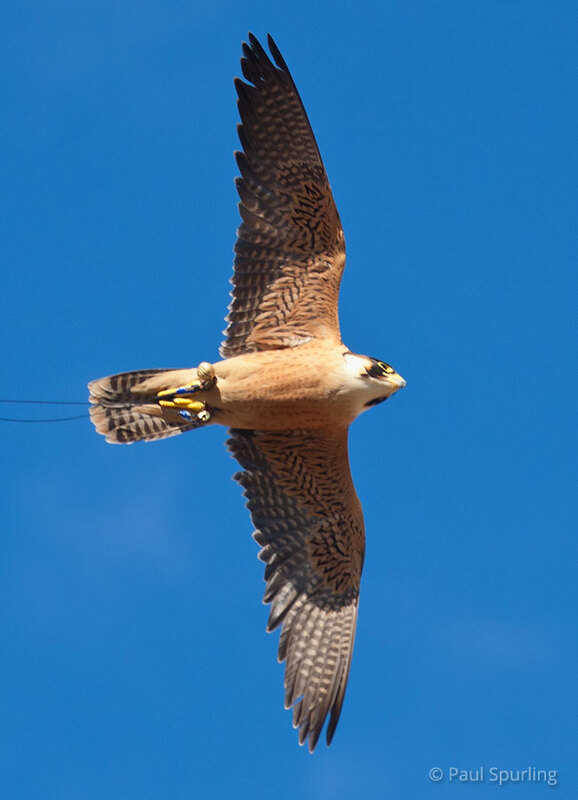 Like most falcons, the Taita Falcon is an aerial dynamo! Swooping, diving, stooping and banking are just a few of the flight moves in this bird's repertoire. Imagine what a sight it would be to see one of these falcons zipping around with breath-taking Victoria Falls for a backdrop! Despite its flying skills, the Taita Falcon never flies very far away. It doesn't migrate and the adults remain on their territory year-round. Even when young birds leave their parents' territory, they usually don't travel far, often dispersing only a few miles away. When these falcons aren't flying, they spend their time perching on rocks and in the upper branches of trees. The Taita Falcon is not a common raptor. They have a small total population scattered over a wide range. Scientists believe that their population has experienced a decline in the past few decades, probably due to loss of habitat, pesticide use, human persecution, and even competition from other birds, such as Peregrine Falcons. Additionally, their young may be preyed upon, mainly by other raptor species including Peregrine Falcons and owls. Some believe that helicopters and other aircraft carrying tourists to sightsee above Victoria Falls may be having a negative effect as well. Like most other members of the falcon family, the Taita Falcon feeds mainly on small birds and insects, but it is also known to feed on bats. Some avian species that may show up on the menu include swifts, bulbuls, swallows, starlings and queleas. Their choice of insects ranges from beetles to termites. This falcon catches most of its prey in the air, usually by diving after it from a perch or from a vantage point high up in the sky. 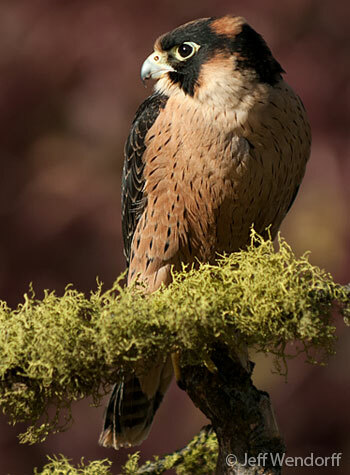 Depending on the prey, however, the Taita Falcon will have at least two different eating styles. If it captures a bird or bat, it will usually carry its quarry in its talons to a safe perch, such as as a tree or a cliff ledge, where it will proceed to pluck its meal, removing feathers or fur, before eating it. If it catches an insect, it won't bother stopping to eat. After seizing an insect in it talons, the falcon will deftly transfer the small snack right to its bill while in flight! A scientist in Kenya, SimonThomsett, observed Taita Falcons perch at dusk on cliff ledges in Kenya. For about 20 minutes or so, he watched the falcons feed on swifts flying to their night-time roosts and catch bats just emerging from their daytime roosts! Like most falcons, the Taita Falcon doesn't build its own nest. Instead, it will find sheltered holes or crevices in cliff faces where it may scrape a small depression in the substrate before laying eggs. Or, it may use an old, abandoned stick nest on the ledge of a cliff face. Because the Taita Falcon's range overlaps with larger falcons, such as the Peregrine Falcon, it is sometimes forced to nest in less than ideal sites. As you can imagine, the larger falcons pick the best sites frst and defend them against others hoping to nest in the same spot. The female lays 2-4 oval-shaped eggs that are a pale buff color with yellow-brown spots. The pair must work to incubate their eggs for 31-33 days. After hatching, the young fledge, or fly for the first time, after about 42 days. Only three weeks later, the young become independent of their parents and must venture out on their own. 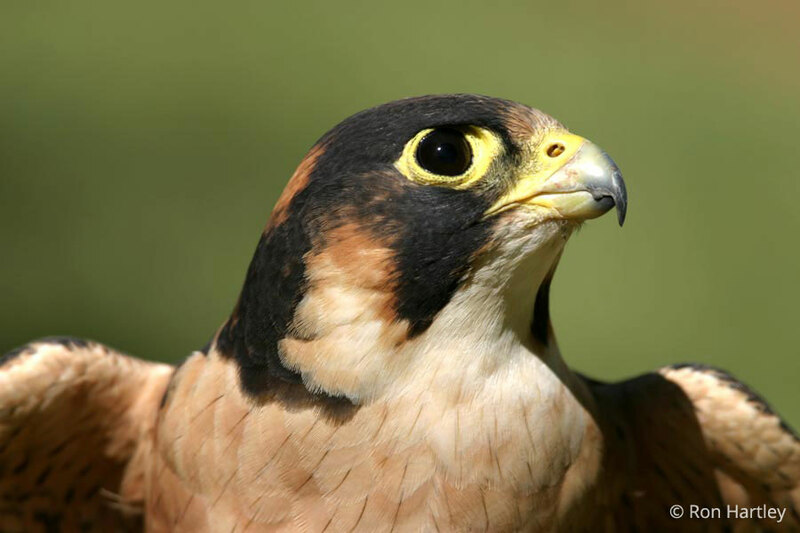 We currently have a Taita Falcon, named Victoria, at our World Center for Birds of Prey. Hatched in 2014, this young captive-reared female came to us as a tiny chick still partially covered with down feathers. We hand-raised her to be an education bird. She travels to events to give people a close-up view of one of the world's rarest raptors. She sometimes participates in the outdoor flight shows in October, as well.